The UH-60 Blackhawk L6 Stats Blueprint is now available in the Event Prizes store, allowing you to upgrade the Blackhawk’s Health, Damage, Mine Defense, and Blast Defense stats to Level 6. Unlock the blueprint as part of this week’s ONP Event by spending ONP in the Event Prizes store! Skywatch Company is ready to roll out, Commander. These boys delight in making sure nothing else can roll out. Three squads are ready to deploy to your Ambush Points. You can now upgrade your Ambush Point to allow you to field Vanguard, Roadblock, and Skywatch Companies at the same time. Able Squad fields eight Rifleman and three Panzerschrecks, plus an addtional Panzerschreck if you field the entire company. Bravo Squad’s spotters field seven Panzerschrecks and three Snipers, plus an additional Sniper if you field the entire company. Charlie Squad’s logistics team fields eight Snipers and three Panzerschrecks, plus an MQ-8B spotter drone if you field the entire company. Don’t forget, your Strike Teams get stronger as you upgrade their component units. Be sure to take advantage of the recent level 13 unit blueprints in the Hardware Store for a considerable strength boost. UH-60 Blackhawk Battle Replay Contest – 1 More Week! 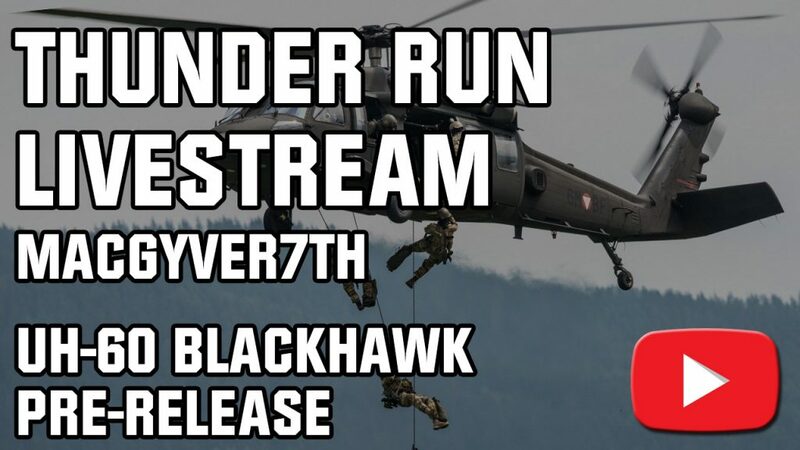 Post a link to your most action-packed Battle Replay featuring the recently released UH-60 Blackhawk unit as a comment on our Thunder Run Community Forums before Friday, March 15th at 17:00 GMT to be entered into the contest and become eligible to win BIG Blackhawk prizes, including a one-of-a-kind custom UH-60 Unit Payload Equip named after yours truly. Post a link to your most action-packed Battle Replay featuring the recently released UH-60 Blackhawk unit as a comment on our Thunder Run Community Forums before Friday, March 15th at 17:00 GMT to be entered into the contest and become eligible to win BIG Blackhawk prizes. The player who showcases the most entertaining and action-packed Battle Replay that features the UH-60 Blackhawk as the primary unit will be selected by our Community Team and announced on the forums on Friday, March 15th. The Level 13 M109 Paladin and Level 11 AH-64 Apache are here! As with the recent unit level cap releases, your Level 13 M109 Paladin and Level 11 AH-64 Apache will also feature improved stats and no increases in battalion space requirements. As with any improvement in power, there are increases in cost, production time, and repair time. The Level 13 M109 Paladin and Level 11 AH-64 Apache upgrades require a blueprint that can only be purchased during Hardware Event Weeks in the Hardware Prize Store. We will continue to release similar levels in this catch-up mechanic boost to more core units going forward. Following the release of the UH-60 Blackhawk last week, we’ve been hearing reports of air cavalry getting stuck on water, and some (like the infamous “Stinger Jesus” pictured above) have even been walking on water to pursue their attackers. It’s a miracle I tell you! Time to put the miracles to rest, however – at least for now. As of today, all infantry placed on water tiles will be subject to crossing paths with the fearsome man eating sharks of Gundar’s oceans (in the case of infantry), or will sink (in the case of armor vehicles). Careful around those shores, Commander! Keep an eye out for more information coming in tomorrow regarding an all new UH-60 Blackhawk Battle Replay Contest where you and your clan mates can win huge prizes… Including never before seen unreleased unit payload equips for the UH-60 Blackhawk. Check back on this space in about 24 hours from now for more information! Air Cavalry, mount up! The UH-60 Blackhawk is ready for deployment, Commander. This tough troop transport is a capable anti-infantry gunship in its own right, but it can also deploy a variety of ground troops to smash through whatever defensive strategy the enemy deploys. The troop compartment does need repairs between deployments, but our grease monkeys assure us that they can handle it. Obtain all the necessary sub-component blueprints before the ONP Event ends. But beware. When they’re gone, they’re gone. Press the ‘E’ key to deploy your troops at the time and place of your choosing. They’ll still deploy if the Blackhawk is shot down, but will suffer a 50% hit point penalty. All UH-60 Blackhawks deploy Riflemen, and deploy Elite Riflemen at level 15. Buy air-dropped troops to supplement the UH-60’s payload. An equip with four Machine Gunners is given for free when you first unlock the unit. Unlock Level 6 before the event week ends, or be capped at Level 5! The blueprint and sub-component are cheaper to help out with this. You will have enough time to unlock all five levels before the event ends, so long as you crush your enemies and obtain ONP quickly. Be wary, Commander! Intel reports that the enemy is already fielding UH-60 Blackhawks at several of their bases! Roadblock Company is ready to roll out, Commander. These boys delight in making sure nothing else can roll out. Three squads are ready to deploy to your Ambush Points. You can now upgrade your Ambush Point to allow you to field Vanguard Company and Roadblock Company at the same time. Able Squad fields six Machine Gunners and five Panzerschrecks, plus a sixth Panzerschreck if you field the entire company. Bravo Squad’s spotters field six Panzerschrecks and five Mortarmen, plus an MQ-8B spotter drone if you field the entire company. Charlie Squad’s logistics team fields eight Panzerschrecks and three Riflemen, plus a GPW if you field the entire company. Want to see a live demo of the upcoming all new UH-60 Blackhawk in action? Come watch Battlehouse Streaming Partner Macgyver7th show off Thursday’s big release on his FB Gaming and YouTube channels! The UH-60 Blackhawk will available to all players on Thursday, February 19th. Livestream is accessible via Macgyver7th’s FB Gaming and YouTube channels. Battlehouse Community Manager Commander Cameron is active in the comments of Macgyver7th’s Livestream to answer player questions and take player feedback. Come let us know what you think about the new coming soon unit! Want to see a live demo of the upcoming all new UH-60 Blackhawk in action? Come watch Battlehouse Streaming Partner Macgyver7th 24 hours from now show off Thursday’s big release on his FB Gaming and YouTube channels! The UH-60 Blackhawk will available to all players on Thursday, February 19th. Livestream starts around 12:30am GMT (5:30pm PST / 8:30pm EST)! Livestream will be accessible via Macgyver7th’s FB Gaming and YouTube channels. Battlehouse Community Manager Commander Cameron will be active in the comments of Macgyver7th’s Livestream to answer player questions and take player feedback. Come let us know what you think about the new coming soon unit! 💌 Happy Valentine’s Day, Commanders! 💌 The Level 13 Stryker and Level 11 AH-1 Cobra are here! As with the recent unit level cap releases, your Level 13 Stryker and Level 11 AH-1 Cobra﻿will also feature improved stats and no increases in battalion space requirements. As with any improvement in power, there are increases in cost, production time, and repair time. The Level 13 Stryker and Level 11 AH-1 Cobra upgrades require a blueprint that can only be purchased during Hardware Event Weeks in the Hardware Prize Store. We will continue to release similar levels in this catch-up mechanic boost to more core units going forward.